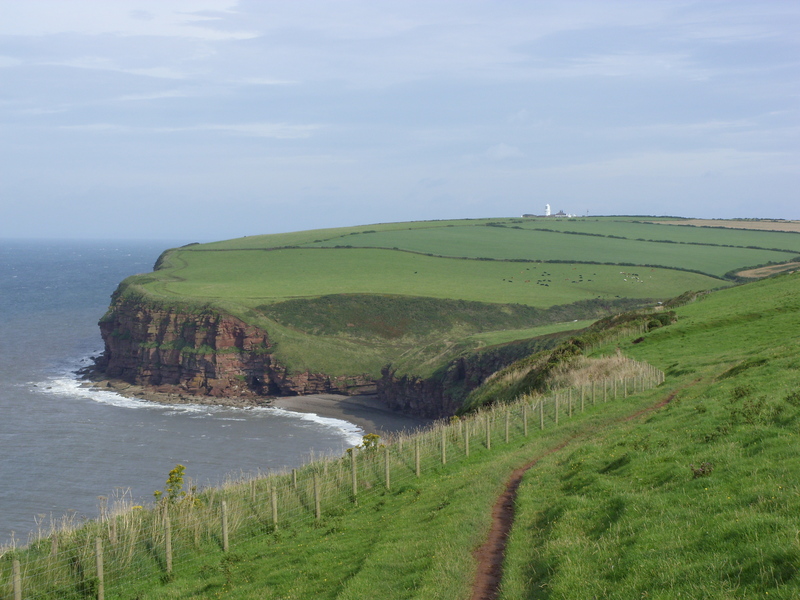 The Coast to Coast is one of the most popular walks in the UK. Devised by Alfred Wainwright this unofficial and mostly unsignposted footpath passes through three contrasting national parks: the Lake District, the Yorkshire Dales, and the North York Moors. Trailblazer Guide (5th Ed. 2012) recently calculated it using GPS to be anything from 198-200 miles or more depending on route choice (there are a few high level alternatives in the hillier sections). The Fastest Known Time (FKT) for the Coast to Coast stands at 39hr36min set by Mike Hartley in 1991, beating the previous best of 46hr40min by Mike Cudahy in 1985. Frank Thomas and Peter Simpson set a time of 51hr10min in 1980. I have had the pleasure of meeting Frank a couple of times over the previous year to discuss the Coast to Coast amongst other things. Having read his and Mike Cudahy’s reports, and seen the splits of Mike Hartley’s record run I had a good idea of the effort and pace required over the route for a non-stop attempt. I was originally going to do a non-stop attempt of my own later this year (2013). Unfortunately despite a good run of wins in the Brecon Ultra, Green Man Ultra and Malvern Hills Ultra I have struggled with injuries, notably an inguinal hernia and chronic ankle issues (L achilles tendonitis, R heel calcium growth). I have had to back off on the training while I wait for my hernia operation, which will hopefully be in the next two months. Complete rest would have little impact on the ankle issues and no impact on the hernia so I have continued to train albeit at a low level while I wait for the operation and enforced rest period to follow it. On 2 June I had a 100 mile ultra race (Enduroman) which I thought I could ‘wing’. Unfortunately, with the injuries, a bumpy, short-looped course and the lack of training I had to pull out around 50miles. I had been running quite well up to that point holding the lead, despite a couple of 15min stops to get through heat cramps/rehydrate. I’d spent the weeks after the race recovering and then carrying out rehab on the ankles to alleviate some of the pain. With all this in mind I decided to take the opportunity to recce the Coast to Coast and delay the non-stop attempt until next year. I’d hiked the 195 mile Coast to Coast with my brother in 2008 over two weeks. We were carrying camping equipment and found the walk extremely tough on the legs. More so than the Pennine Way walk we’d done the year before, covering 270miles in the same 2-week period. I decided to make my 2013 recce challenging by trying to complete the distance in under 4 days. This would also give me a feel for multi-day running/walking, while still enabling me to enjoy the best views the Coast to Coast has to offer. I’ve previously done two 1000mile LEJOG routes with a weighted (camping) bike over 10-14 days so I had an idea of what it felt like to push through several days with effort, but running would be a different matter. Originally I considered taking a bivvy bag (large and durable waterproof bag used for outdoor sleeping). But with the injuries, extra weight, predictably cold and wet weather, and low fat % I decided it would be in my best interests to book accommodation in advance. In order I booked a Youth Hostel, Inn and 2 x Camping Barns. I did not know what to expect from the camping barns, but they sounded fun and suitable to my basic requirements. 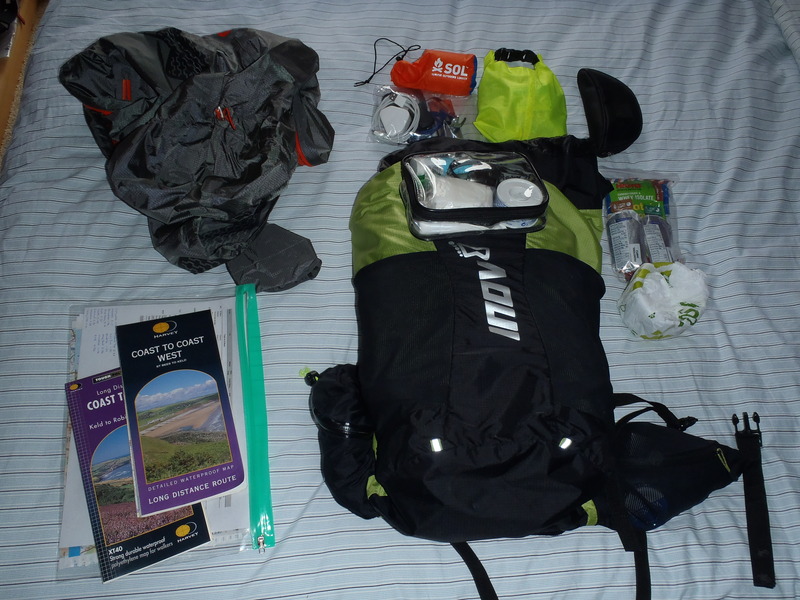 Apart from the accommodation I was completely self-sufficient up to the final day ie I would carry everything I needed with me to get through the 4 day period. I’d created an excel sheet in advance listing all the light-weight items required (I was quite thorough with this using electronic kitchen scales to compare items) and practised a few miles running with the equivalent weight. I found that 5kg was about the limit to enable me to hold running form albeit at a slower sustained pace of circa 9:00mins/mile. My pack weight came out at 4.5kg, but that without food and liquid. I put together 300g of emergency food (900cal). So with a full 750ml bottle I was looking at 5.5kg for the overall backpack weight as a minimum. I knew that on the longer sections of the route where I couldn’t get food or water (apart from streams) that I would more likely be carrying around 7-8kg. At 7am on Saturday 22 June I started my train journey from Hampton to St Bees, arriving shortly before 2pm. I knew that two friends (Den and Warwick) were going to run the final 30miles with me on the final day (Wednesday) from 9am, and if I was to finish within the strict 4 day period then I’d need to start as late as possible on the Saturday. 3pm seemed a good time to start, hoping providing enough daylight to get to the Youth Hostel in Borrowdale. I didn’t know what to expect of the conditions underfoot, and was a little worried about my choice of shoe. I decided against my more aggressive inov8 roclite 295s that I use for races. Instead, I chose a pair of New Balance Leadvilles, a hybrid shoe suitable for longer distances. They provided more cushioning and a lighter grip around the heel/achilles. However, the tread is more suited to flatter, drier trails so I was a little concerned about how they would handle the Lakes. I was expecting a lot more mud along the coast from St Bees head but after the climb from the beach I had no problems at all running along the trails with the backpack. This evening was going to be tough. With 30 miles to cover into the Lake District from a 3pm start and with a backpack I couldn’t afford to waste any time. 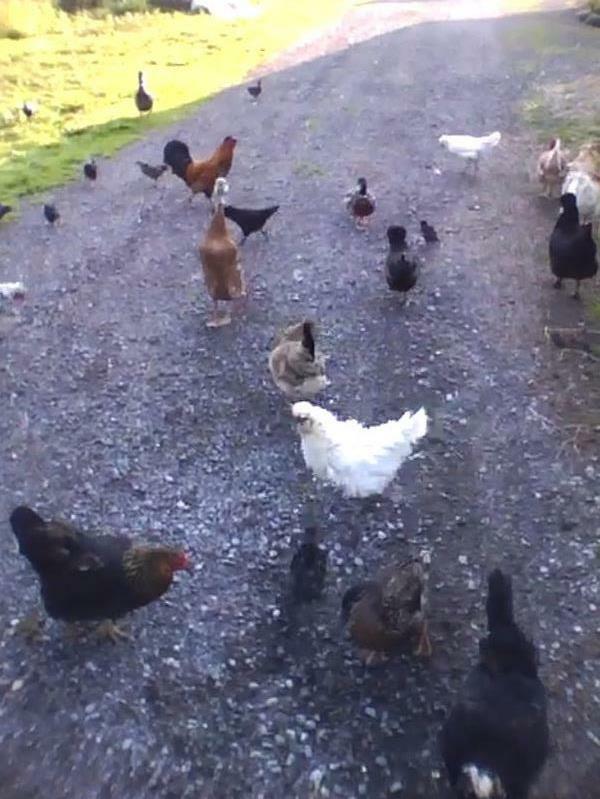 Any walking would be limited to the steep inclines and/or during feeding. Pacing : I knew I could run circa 8:30/M+ with a 5kg backpack over shorter distances. The heavier the weight (food, liquid, wet gear) and the further I run, the slower pace would inevitably get. Add to this the accumulated leg fatigue each day and dehydration I was looking at 9 or 10mins/mile at best on the flat, let alone over mountains and uneven ground. I’d tried to be as conservative as possible with my estimates before I started, but in practise I still found them to be right on the limit and the overall pace for the trip was lower than expected. My first navigational error came just a few miles inland at Stanley pond. I took the wrong, more prominent trail and had to back track 50m. This only wasted about a minute of my time, but when you work hard for every minute it can be a little annoying. This would happen a number of times during the rest of the trip. At Cleator I was hoping to replenish food and water, but for some reason the shop was closed, perhaps due to a local festival. This was a little annoying but at least I knew there was a pub at Ennerdale Bridge a few miles further en route, and would juts have to get by until then. Nutrition : I tried to always carry around 900cal of back-up food (gels and salted nuts) and 750ml of liquid. If I drank enough at each village/town I passed through then I could get through 2-3hrs without the need to refill my bottle. I did have some chlorine tablets with me should I need to drink from streams (this was never required). On the longer sections eg Haweswater(Sun) and North York Moors(Tue) where I would need to cover up to 6-7hrs I took an extra 2ltr of water. I started Sun and Mon mornings with a large English breakfast. This would ensure a huge cal intake to kick the day off including protein to help repair the damaged muscles from the day before. On Tue and Wed (Camping Barns) I would finish off most of my snacks from the previous day. I didn’t keep a count of cal intake per hour, preferring to eat on feel. But I would continue to try and get a decent intake around lunch, dinner, and snack in between. The first notable climb of the Coast to Coast comes just past Cleator, on the climb up Dent hill. I could now appreciate how difficult the uphills would be with the extra weight on my back. I decided just to walk and enjoy my surroundings. The other side of the hill was almost too steep to run. It can be annoying to work so hard up a hill only to find the reward is too steep an ascent to make up lost time. At Ennerdale Bridge I headed straight to the pub, downed a pint of coke, filled up the bottle, and was on my way. A couple of miles later I reached Ennerdale Water, the first of the major lakes. I forgot how uneven it was around the lake, thinking I could keep a pace up and make up time. It was around this time that the rain started. It was quite light, but it would be with me for most of the next two days through the Lake District. I don’t think I’ve ever visited the Lake District when it hasn’t rained. I had a little trouble finding my way from the end of the lake back on to the track that would take me up past Gillerthwaite Field Centre. Sometimes it’s better to take a longer route on an obvious track/path rather than taking the marked route. As the rain started to get heavier and the clouds darkened I was looking forward even more to a brief stop at Black Sail Hut, a small Youth Hostel just short of the climb out of Ennerdale. I was getting cold and the thought of a log fire, hot drink and cake was welcoming. However, when I reached the door I noticed a temporary sign claiming only residents were allowed in. I was a bit annoyed by this. I opened the door to spot a large, hairy man stirring a large cauldron-like pot(!?). Rather than make a scene I decided to press on over Honnister and leave Hills Have Eyes to it. 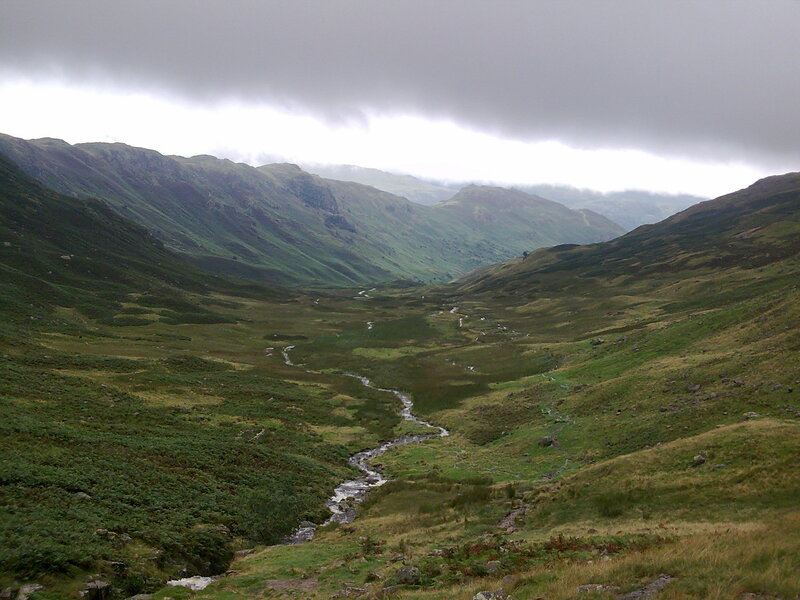 I was now at the start of my first climb in the Lakes that would take me up alongside Loft Beck and up to Grey Knotts (600m) before dropping down to Honnister slate mine, and then following the road through Seatoller to Borrowdale. The climb was very marshy underfoot and as the rain came down and the temperature dropped I was encouraged to push hard to Honnister. I finally reached Borrowdale Youth Hostel at 8:45PM. The first evening had been quite challenging and I was worried about the next couple of days covering 56 and 40 miles over the Lakes and Dales. Could my body take it, would I adapt or would I grind to a halt? 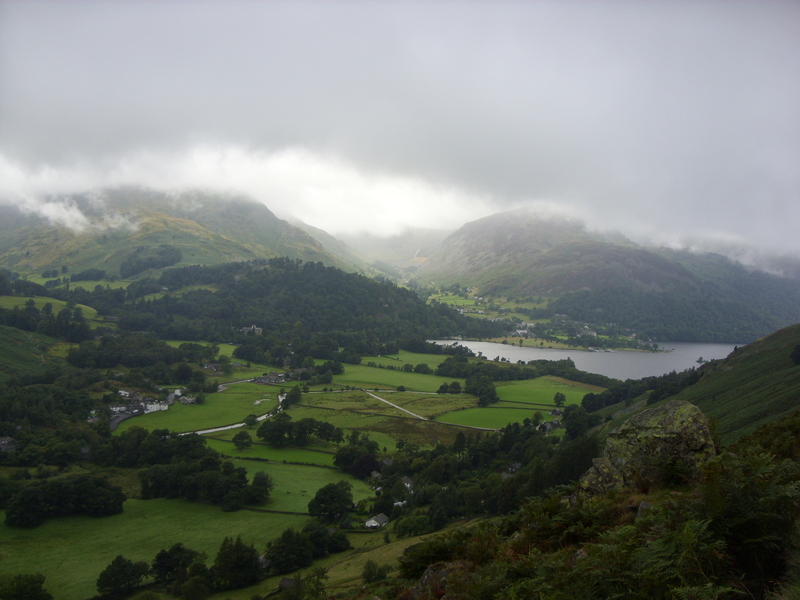 I’d stayed at Borrowdale Youth Hostel before, with my brother. It’s a decent size with a pub/lounge, drying room, showers, dining room and reading room. Anything you could require, although quite costly at £19 shared. I was showed to my room by two giggling girls who were proud of the fact they knew every room in detail. The room contained three bunk beds. I had one bunk to myself, as did the elderly man who was there on my arrival. He was running a Duke of Edinburgh Award weekend, but decided to stay at the Youth Hostel while his charges were slumming it in a nearby field, class! We were joined by a couple of others later in the evening, both too tired and wet to show much enthusiasm, although they perked up in the morning. I made use of the drying room, leaving my shoes there overnight. Because I’d arrived so late the only food available was bar snacks. I filled myself up with biscuits, flapjack and cake and then spent the rest of the night with disrupted sleep. This was partly due to my fatigue and rushing around to sort my gear out, but also eating such high sugar foods so close to sleep. I have always had a problem sleeping with high(er) blood sugar levels. I woke up at 7am, had breakfast and was out of the door by 8:15am. I would have liked to have left a lot earlier, but I decided the high cal breakfast would hold me in good stead for the rest of the morning. 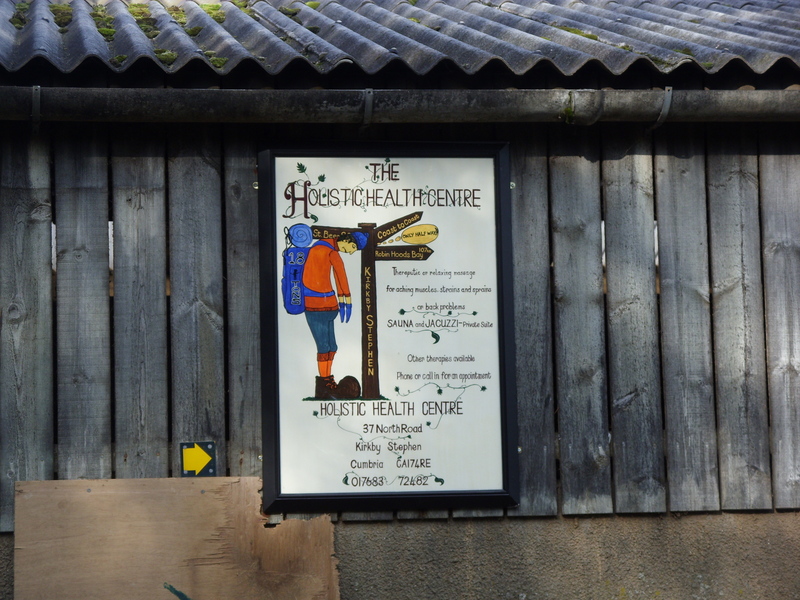 A nice relaxed start through Rosthwaite to allow the breakfast to settle, before gradually picking up a light jog along Stonethwaite Beck. I could spot the DofE kids in the field across the beck and wondered what they thought of their leader experiencing a much more comfortable nights sleep. It was still overcast with some light rain but I was in good spirits. The route continued up the side of Greenup Gill and Lining Crag, generally quite rocky sections with a few streams that required careful negotiation. The view back down to Borrrowdale was stunning. After Lining Crag I was presented with a scramble up a steep stream/waterfall, followed by a marshy area at 600m with no notable path. Luckily it wasn’t misty so I could use my bearings and was able to find my way down Flour Gill and Mere Beck without any problems. It became quite boggy at the base of the beck and this time I decided to walk around in places to save my trainers (and feet) for the rest of the day. It’s quite funny to consider how much time is wasted in these boggy areas when my feet would inevitably get a soaking at some point anyway. I skipped the higher alternative route over Calf Crag and Gibson Knott and instead pressed on the normal route down the valley to Grasmere. Route alternatives : there are several alternatives along the Coast to Coast, particularly high level routes in the Lake District and Dales, adding a few extra miles and time. Some are weather dependent recommendations like the alternate routes off Nine Standards Rig in the Dales, whereas others simply provide the walker with an arguably more interesting but demanding route. I’d walked some high level routes with my brother in 2008. This time I chose what I felt to be the quickest route choices with a fast non-stop attempt in mind. The route turns short of Grasmere, heading past an independent Youth Hostel. It was 11AM and rather than head into town for a few supplies I decided to top-up my bottle at the Hostel and then carry on up to the main road and then once again hit the track going straight up Tongue Gill towards Grisedale Tarn (550m). I enjoyed exchanging a few words with the other walkers, but it was quite a grind on the body. Despite my relief at finally reaching the top and the great view of Grisedale Tarn, I was now starting to consider how tough the section from Patterdale to Haweswater was going to be later in the day. After a long run down and along the valley I finally reached Patterdale at 1PM having covered 17 miles. It was still quite cold and wet so I took no longer than the 15mins required at the local shop to down some liquid and stock up on enough food and water to get through the next 5-6hrs. I was feeling quite bloated as I approached the biggest climb of the day to Kidsty Pike but it was all investment for the hours ahead and I made the most of the stunning views back down to Ullswater. 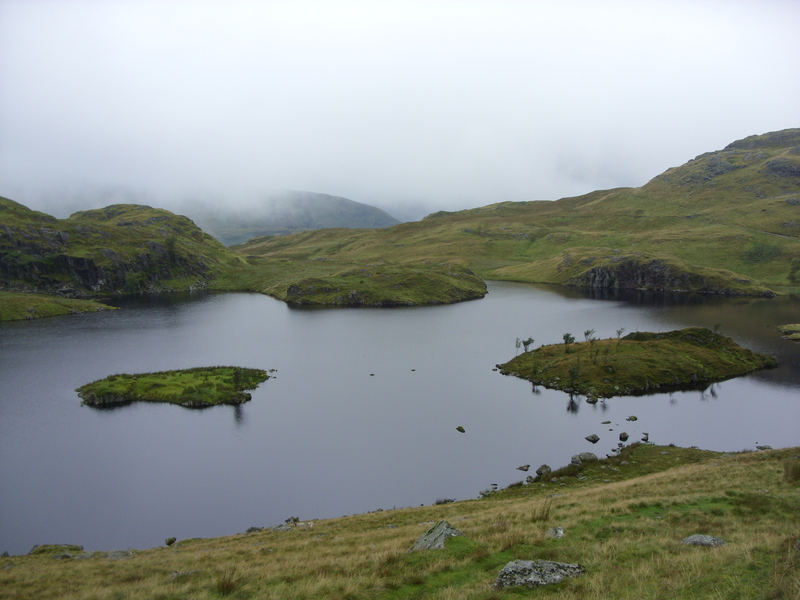 Angle Tarn is a beautiful spot, and if ever I was going to bivvy through the lakes, one of the islands in Angle Tarn would be on the list. I took a wrong deviation shortly after leaving the tarn and lost a little time. But with a little patience using the compass and studying the topography of my map I managed to get back on track. Navigation : I carried at all times one of the two (East and West) Harveys maps of the Coast to Coast route. In normal conditions this would be enough to navigate your way through without too many problems. I wanted to reduce the risk of errors so I had also downloaded someone else’s saved route from Garmin Connect. I was then able to keep an eye on this on my GPS watch, which also served to let me know my overall average pace and miles covered. I also carried a compass, which I took out on a couple of occasions as a second opinion. In misty conditions I would have probably used it a lot more. I had Google Latitude (GL) running in the background on my iphone during most of the days. GL links up to your mobile and shows anyone (also registered on GL) your current whereabouts in the form of an icon on google maps. Very handy, although not completely accurate especially on the mountains and valleys when reception isn’t great. It also eats into the mobile battery. And on one occasion I had to turn the mobile off (at 5%) for emergency contingencies. Overall GL is great for friends and family who are worried for your safety, and has its uses in races (with good reception) as crew are more aware of your whereabouts. I was now on the highest part of the whole route, climbing from the Knott (750m) to Kidsty Pike (780m). The wind was becoming so strong at this point that it was taking hold and I had to keep my head down and steer clear of the cliff edge to my right. 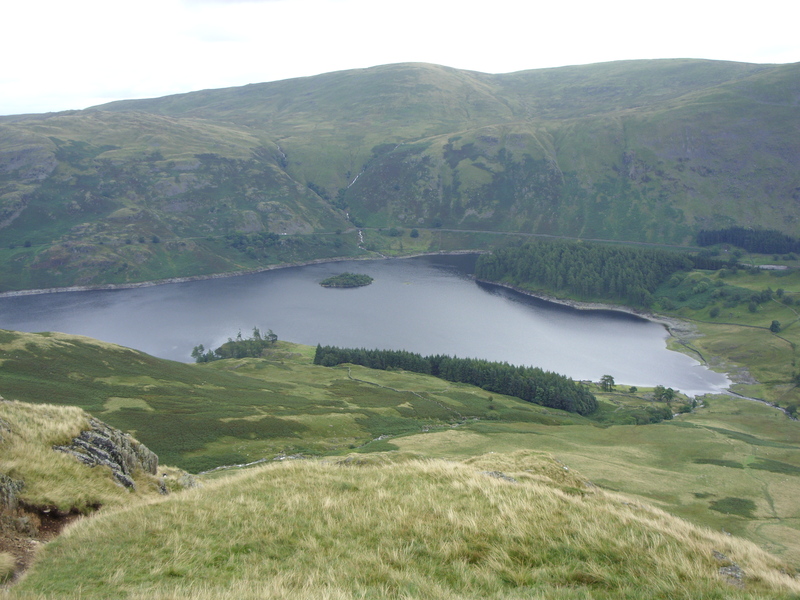 Before long I was over the Pike and heading down the long descent to the start of Haweswater. I could make up some time here, until I reached the rockier section halfway down that required a little scrambling in parts. The seven mile stretch along the side of Haweswater Lake to Burnbanks was, like Ennerdale, a lot tougher than I remember. But in the final mile I started to pass a lot more walkers and conditions underfoot were a little better so I could finally pick up a little running through the lovely village of Burnbanks, a popular spot for the protected red squirrel. There was an Honesty Box by the side of the road at Burnbanks. An Honesty Box is a box containing snacks and drinks (usually fizzy drinks, water, flapjacks, chocolate bars, etc) and another container for your money. The idea is to take what you want, leaving what you feel to be the right amount of money to cover it. I’m sure the walkers coming through like myself, really appreciated and were ‘honest’ with their payments. But I can’t help but feel that such a thing would be abused if placed closer to towns. I could now enjoy a more pleasant section following streams, through fields towards Shap Abbey. I chatted to a few other walkers and was now looking forward to a stop at the Shap chip shop before the final eight miles to Orton. I reached the path to Shap Abbey at 6PM. I’d covered 33 miles for the day and had now put the Lakes behind me. I would have liked to stop and admire the Abbey, but the thought of a few more mins lying on a B&B bed was much more alluring. This did in part sum up my experience of the whole trip – not enough time to appreciate my surroundings as much as I’d like. I bought a bag of chips from the Shap chip shop and spent the next mile devouring them as I walked out of town and over the M6 (a reminder of daily life). I was glad to press on over the Moors. I could incorporate a little running/shuffling here and there but I was now becoming quite fatigued. I’d already covered 35miles for the day and it was taking it’s toll. When I reached Orton I had done 40miles and the backpack was bearing down. I was pleased to get through the day without any major problems, but was conscious of a longer but flatter 56mile section the next day. I arrived at the George Inn at 8:15PM. It was a basic room, with a shared bathroom. I made the most of the pub food, this time arriving in time for an evening meal. I had burger and chips, washed down with a pint. I felt earned that. The owners were good enough to take my damp clothes to a ‘boiler-room’ (although they presented them to me still damp in the morning). Since I was a child I have experienced the occasional light hallucination at night when I have a fever. I was both full of food and had a slight fever (the body’s reaction to the prolonged stress) when I went to bed. At one point in the night I awoke to see a dark figure looming right over my bed. I followed this figure with my eyes as it very slowly glided along the side of my bed to position itself next to the toilet door. For a minute my heart was pumping as I tried to rationalise what I’d seen. It finally dawned on me that the current shape was in fact my marmot rain-jacket hanging to dry off the door. Somehow my brain had super-imposed that image beside my bed, before it moved back to its original position. I had another ‘experience’ the following night at Brompton Camping Barn, but it wasn’t as strong and was soon forgotten. Unfortunately breakfast was served from 8AM. This left me in a predicament. Should I start early to get the mileage in and miss breakfast, or start late off with a heavy breakfast and time-check my way through the day. Once again I chose the latter! Anyone would think I was in a rush. The elderly couples in the bar had barely tucked into their cereal when I had polished off my full English and was off to pack my bag for an 8:30AM start. I had been looking forward to the run through the Dales today. The weather had improved. Despite a little drizzle it was mainly dry and warm throughout the rest of the trip with a little light cloud. I did however start the day yawning a fair amount thanks to the disrupted nights sleep. With 56miles to cover, today was going to be tough. I would keep on the move, but try and relax and tick off each section as it comes. I managed to sustain a 10mins/mile shuffle over roads and fields. Ravensadle Moor wasn’t too bad underfoot but I did have to negotiate a few boggy parts. A drop to Smarsdale bridge and a long uphill over the moors before the descent to Kirkby Stephen. I managed to hit my target time of 11AM for the first 13 mile stretch but spent a good 20mins in the town eating, drinking and stocking up for the section ahead to Keld. This was time I’d not accounted for and meant I had to try and make up time as soon as I could so I didn’t fall behind for the day. I walked on the climb out of Kirkby Stephen. I’d just consumed around 1000 calories but I could find a little running on any flat sections. I decided to turn off before Nine Standards and take the Dec-April route which follows Dukerdale to the B6270. I was worried that my shoes wouldn’t be able to handle the deep mud over Nine Standards and White Mossy Hill, and I was tight for time. I reached Keld at 2PM having covered around 25 miles and headed straight for the village campsite café. I was still just about on time but gave myself another 20min break as I knew I’d have the long 12-13mile section to Reeth. The lady in the café was very friendly and told me to stop by during the non-stop attempt next year if I needed anything. My plan was now to take the low-level route along the river bank from Keld to Reeth. It would enable me to make up some time and take less out of my legs than the rockier high level route. It also gave me the options of stops at Muker (café) and Gunnerside (pub) should they be required. Kisdon Force waterfalls at Keld is the point at which the Coast to Coast crosses the path of the Pennine Way National Trail. It was the third time I’d passed this point, which held some good memories. I didn’t have time to appreciate it as much this time, and pressed on up the hill past some quizzical looks from walkers. I’d walked the high-level route over the old lead mines with my brother in 2008. This time I took the low-level alternate route that runs along the River Swale through Swaledale. Beautiful views down the Kisdon Side valley towards Muker. I started to get nerve pains along the top of my right foot in particular. This was from rubbing/pinching and meant I had to loosen up the laces a little. Now that the major hills were out of the way and I had a long flat run on softer surfaces I knew I could afford to loosen the shoes up and let the feet breathe a little. There were a lot of walkers out on the fields between Muker and Gunnerside. With 50% running over lush grass, a clear sky, and the sound of the Swale and wildlife in my ears I really enjoyed myself. I was averaging a pace of around 10-11mins/mile which meant I could hit my target – of reaching Reeth at 5PM. I even managed another 15min break in a field near Healaugh checking out some of the wildlife. At Reeth I once again drank and ate as much as my stomach could handle, topped up my bottle and bought enough to get through the next 11 miles to Richmond. I wasn’t expecting to get through the whole trip without some form of injury or niggle, and it was the climb through Steps Woods above Marrick Priory where I suddenly felt sharp pains on the inside of my L gastrocnemius (upper calf) where it attaches itself to the knee. This pain was felt on the inclines rather than the downhills. I tried to massage it out, but the damage was already done and it was only these short breaks that provided momentary relief. This pain would get worse over the rest of the day so I tried to take it easy on the uphills to follow. Thankfully it was not too hilly. I continued along the route through more fields and farmland past Marske and then the final short climb up on to Applegarth where I would follow the track and road down into Richmond, the largest town on the route. It was now closing in on 8PM when I reached Richmond having covered 48 miles for the day so far. I didn’t want to waste too much time as I knew I didn’t have far to go. I bought enough food to get me through the evening and breakfast (as I didn’t expect to have the opportunity to buy anything until Tuesday lunchtime in Ingleby) and some painkillers for the feet and calf injury. It was now getting dark and the temperature had dropped as I left Richmond. My brother and girlfriend were both at home following me on GL, exchanging the odd text as they saw my icon move around google maps. When I reached a field at St Giles I needed to find a footbridge to get to the north side of the Swale, to Brompton and the Camping Barn. I was sure I was standing in the right field and entertained the idea of phoning Dean or Yve to see if they could guide me via GL (see pic below). I’m not sure it would have helped but I managed to find my way eventually, climbing over a fence and down a steep wood to the footbridge. GL – You can see where I have to go to cross the river…but I can’t! I arrived at the Camping Barn just after 9:15PM. I was quite impressed with the facilities (only £9) having been in much worse Hostels. I also had the place to myself. Unfortunately I didn’t have the time to appreciate the facilities. By the time I’d soaked and dried clothes, had something to eat, strapped my upper calf up with zinc oxide tape (worked a treat!) it was time to sleep. 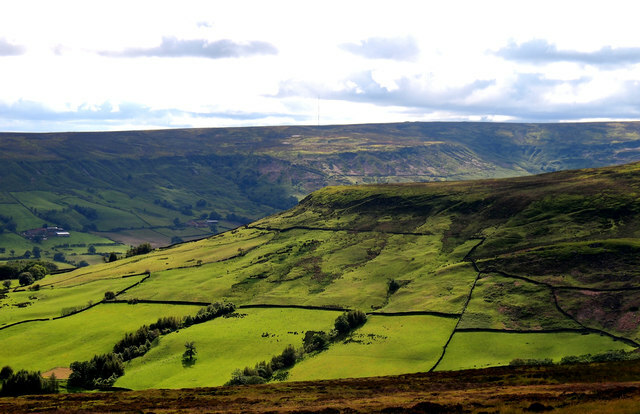 The Vale of Mowbray between the Dales and the North Yorkshire Moors is the flatter part of the Coast to Coast route with more beautiful views across fields and farms with the odd road section between. 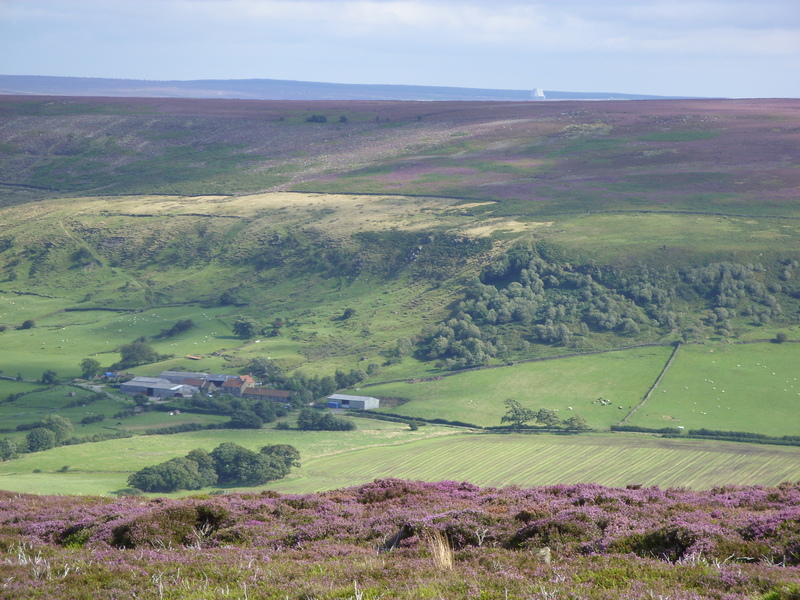 The North Yorkshire Moors would come around 18 miles later from Ingleby. The weather was great and I even found the Brompton supermarket open which was a pleasant surprise, so I could stock up on food. The first few miles were spent running alongside the Swale past Catterick Bridge and through Bolton on Swale. I stopped for a moment at the church as they had some drinks and nibbles with another honesty box (I’d pass one more honesty box at the back of a farm over the following miles, supplying flapjacks and coke). I continued shuffling along the road through Streetlam and Danby Wiske. The sky was clear, it was starting to get quite warm and I found myself passing quite a few other walkers once again. At one point I passed a group of around 20-30 elderly people who were quite fascinated by the fact I was trying to run the whole thing with a backpack. If Alfred Wainwright was still alive though I’m sure I’d have been scorned. At the A19 crossing at Ingleby Arncliffe I took my first proper time-out, making the most of the café beside the service station. Funnily enough I can’t remember what I ate, but it certainly involved plenty of chips, beef and gravy. It was now 12PM. I’d covered the 18 miles in 4 hours. The following 22 miles over the North Yorkshire Moors were going to be a real test. As far as Clay Bank top it’s a relentless up and down over 300 to 400m summits. The one potential pit-stop en route (Lord Stones Café) was under redevelopment, so I was a bit stuck. I’d listed a number of towns and villages within 1-3miles. But as well as the extra distance required to reach them, it would involve climbing back up on to the moors once again. I didn’t want to make this any tougher than it was. So I decided to once again eat and drink as much as I could stomach at Ingleby, walk the first few miles uphill though Arncliffe woods, and then spread out a 2ltr bottle and snacks for the rest of the evening to my destination at Farndale. The climbs up and down the hills with 8kg on my back in hot weather sapped the last of my energy. I couldn’t run the descents because they were too steep and rocky. And by the time I got on to any flat summits I was too tired to develop any kind of pace. Once I was past Clay Bank Top I knew I’d only have one more climb before the dismantled railway at 450m which goes around the top of Farndale and Blakely Moor. I reached Clay Bank Top at 4PM having covered just under 30miles. I was just ahead of my schedule for the day. I now had 9 miles to cover to reach the Lion Inn on Blakely Moor and then find my way back down to Farndale Camping Barn. I wanted to be done by 7pm if possible. When I reached Bloworth Crossing (where the C2C joins the Cleveland Way and runs along the dismantled railway line) I was completely drained. If I was fresh I would have enjoyed this flat and spongy section around Farndale. After reaching the Lion Inn I doubled back thinking I could find a more direct path track off the hill. I couldn’t. The broken paths marked on the Harveys map were long gone. I decided to plot my own way through the heather, but came unstuck at the top of a 30m drop at Potters Nab. I sat for a while considering my options. I could head back up a mile through the heather to the Lion Inn and then walk down and up the Farndale valley for 3-4 miles. Or I could take a slight risk and scramble down the ridge, over a fence and through the following field and woods. The adventurous side of me took over and I went for the latter. I was a bit wobbly at first, but after chopping my way through some of the thicket in the woods, while preparing my excuses for Elma Fudd I eventually found a stream that came out of the back of someone’s farmhouse. Some curious looks were thrown my way so I made a hasty retreat. Farndale Camping Barn was in stark contrast to Brompton. Initial booking cost was the same, but there were extra costs of £3 for sleeping bag hire and £4 for a bag of wood for the fire. The wood stove was near useless. The owner told me I needed a breeze through the front door for it to work(!). After a couple of attempts I gave up. Unfortunately my attempts had meant that the upper part of the barn (with the bunk beds) was half full of smoke with no means to air it out. On top of that I found the top bunks had bat droppings. At least I could get a warm shower (despite the light not working). I would once again have to start the next day with dry dirty clothes, this time with a smoky flavour! Despite all this I managed to finally get to bed around 12AM, only to wake with a start from 2:30AM by two cockerels right outside the barn. And they wouldn’t give up, continuing right through the morning. I couldn’t sleep but I tried not to stress about. I simply rested my legs, while lying amongst bat droppings, stinking of wood smoke and dreaming of the sea. A normal morning. I was looking forward to the run today. 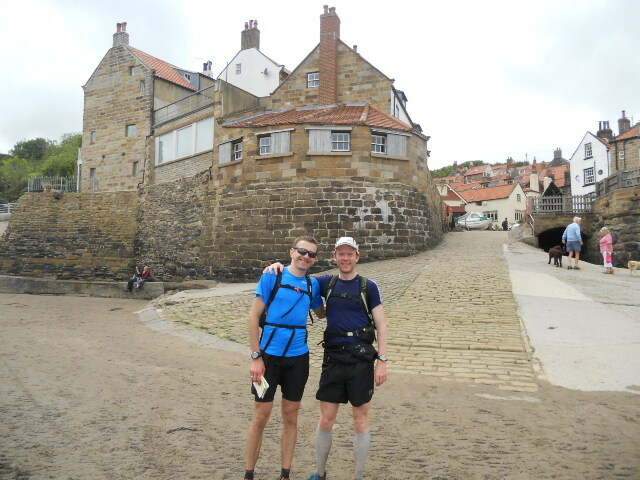 A couple of friends, Den and Warwick, were going to meet me at the Lion Inn from 9AM and run to the finish at Robin Hoods Bay. 30miles in total, hopefully finishing before 3PM. Thankfully Den drove up the Farndale road at 8:30AM to take me back up to the Lion Inn. Warwick was ill, but would meet us in Robin Hoods Bay when we were done. My calf was a lot more manageable now I had it taped up, but the nerves along the top of the feet were still a little raw so I loosened the laces further on the shoes. We started just before 9AM and got straight up to a decent pace. Den was great company and helped take some of the weight off my back. I was a few kg lighter and it certainly made a difference, although by now my legs were quite stiff from the previous 160+ miles. We passed the time in good spirits hitting around 8:00/M over the easier sections of the moors down to Glaisdale. The views once again were stunning. We felt even better after tucking into some home made pies from the famous Butcher in Glaisdale (10:30AM). After we topped-up we got back up to speed running through Arncliffe Woods, Egton Bridge and along the track to Grosmont Railway Village. It was 11:30AM and we were well ahead of schedule. We now had just 14 miles to cover in the next 3hr30mins to get under my 4day target. Apart from the steep climb out of the village I couldn’t see there being any problems and we were now thinking about getting home by 2:30PM. As we approached Grosmont, Den ran ahead to the shop to top-up with drink and snacks and grab some sun tan lotion (yes it was getting rather warm). The plan was for me to continue walking through the village and get a head start up the steep hill. Den is a 2hr39 marathon runner so I knew he’d have no problem running up the hill with all the extra weight on his back. Unfortunately just as I turned a corner I noticed the Grosmont steam train move across the main road. I came to a junction in the road and seeing as Den didn’t know the route, I took the opportunity to sit for a few minutes and take a break. We thought we had plenty of time. Sleights Moor was a little boggy in parts but we picked our way through and downhill to Littlebeck, where we had a great run up through the Scarry Woods and past Falling Foss. The boggiest part of the whole trip came just before the B1416. Once again we spent so much time trying to picking our way through and save our shoes/feet, that our feet were soaked by the end anyway. The following few miles to Hawsker were also quite hard to navigate and we were now a little worried about the time. We passed Hawsker (2PM) and I calculated that we had to go under 12mins/mile for the final 5mile stretch. So much for the relaxed finish! Den did a great job of pacing me for this last section around the coast. Shouting words of encouragement and staying about 10-20m ahead, it worked really well and we were hitting 10:00/M over uneven terrain. It felt as hard as any ultra race I have competed in. Everything was over-used and the body just wanted to take a break. As we ran down the steep hill of Robin Hood’s Bay Den spotted Warwick in one of the cafes and gave him a shout. He made it down to the sea front and our finish line in time to take a couple of photos. It was now 2:50PM. I’d completed my 195mile Coast to Coast recce in 3days 23hrs 50mins. After grabbing a coffee and cake we all headed to Scarborough for fish and chips. 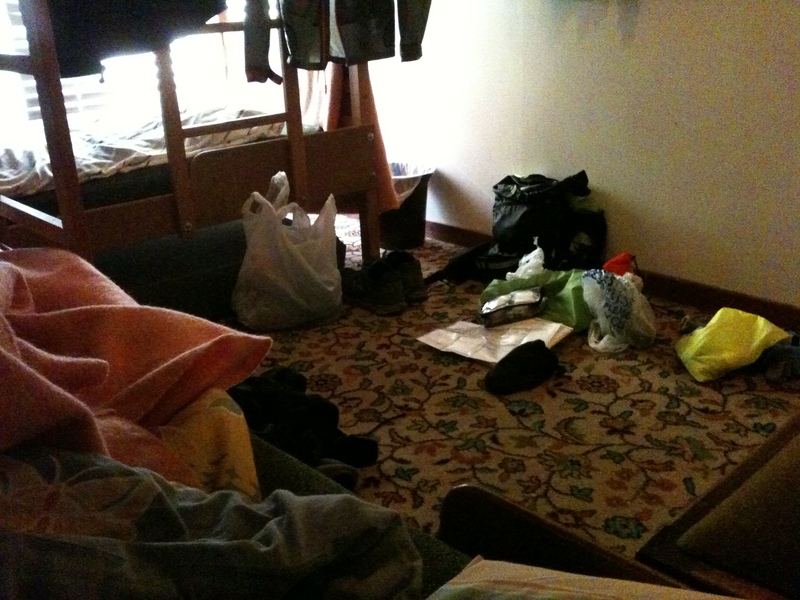 I would be spending the night in a local Guest House before travelling back to London the next day. Warwick was good enough not only to provide me with beer but also a pair of socks, as I’d lost one sock and the other pair were on their second day and developing a life of their own. The Guest House was very comfortable. I could finally get some clothes soaked and dried, and then kick-back and watch some TV. I enjoyed the whole Coast to Coast experience once again. It enabled me to recce the course with a non-stop attempt in mind for next year. It was a lot more demanding than I though it would be. Of course carrying the weight on my back, lack of sleep and a few injuries didn’t help. But it’s amazing how the body adapts and I wonder how I would have fared if I’d continued a few more days. Sub 4 days was a good challenge. With support and good accommodation I believe this is achievable for anyone with a good background of long distance running/hiking. If I was rested and had assistance I believe I could have completed it with overnight accommodation in under 3 days. For my non-stop attempt I would like to set out with 46hrs in mind. This would give me a shot at the second fastest time set by Mike Cudahy in the 80s. Sub 2 days would be a secondary target should I struggle a little towards the end. Obviously with my background I’d be starting out faster and slowing down in the second half. I’d once again go from West to East to get the Lakes and Dales out of the way while I still have the strength, with a prevailing wind. Something like this cannot be done without a great support team. Hopefully I can get some friends together just like the Cotswold way record. Having someone to pace, carry your gear and keep you motivated is paramount. Knowledge of the course would be useful, although I don’t mind navigating now that I have traversed the route on two occasions. I’m looking forward to it. Great write up. I am sure you will do well on your non stop attempt. I did it in August 2013 in 3 days 15 hours, unsupported and carrying a wild camping pack, mostly walking, but had straightened the route a bit, knocking around 25 miles off. Had previously done West to East on the full AW route in 4 days 15 hours, then East to West in 4 days 11 hours again carrying wild camping pack and all walking, no running. Going for sub 4 days next time, probably not 2014, might wait until I turn 70 in less than two years time. Hi Dave, that’s great! How much of the time did you spend on stops including sleeping? I was going to make a <48 hrs attempt this year but because of health/injury it's unlikely (unless I go for 3 days). I may try next year. Great route isn't it! I agree Dave, this is a great write up! Like Darryl, I would also be interested in hearing more about your rest pattern as I would like to do the Coast to Coast in a decent time but am certainly no runner! Hi Darryl, I had 6 stops en route totaling 4hrs 10 min, plus 3 camp stops totaling 11 hours, so taking all that out of my time, I spent around 72 hours on the move. Finished the Spine this year after getting so close last year. I hope that link works, to view my other bloggs, click on my ‘complete profile’. Dave, what’s your email (or facebook link)? I’m on dcarter73@hotmail.com. I’m looking forward to reading your blogs on the Coast 2 Coast. I’ve just stumbled across this blog post – great write up. I fancy having a go at C to C myself. I did my first ever marathon (Brighton) this year and have my first trail marathon in October. Do you have any recommendations for how to begin planning such a thing? I presume you are planning ahead to 2017? And will it be similar to what I did by having accommodation each evening to recover, but still push through a decent number of miles (running) each day? I think anyone who’s built up a good base of mileage with some long runs and hikes can do 4-5 days with accommodation. But you’d need to work on pack weight or have someone carry things for you. I managed to get pack weight to a minimum and pick up nutrition as I went with one change of running clothes. Couldn’t go much lighter unassisted. So you’d need to gradually build up your weekly mileage and occasionally throw in an ‘ultra run’ or full days hike. Then when it’s warm enough next year I’d recommend either a multi-day hike or bike ride to get used to time on feet over several days. If you’re going for 5-7 days then you can cruise it a little more as the mileage is going to be 28-40/day. A case of simply a few miles running here and there, and can be done with a heavier backpack. But depending on your frame needs to be at least <10kg (larger size) and pref <6kg. Good luck with it, let me know how you get on. Which trail marathon? Plenty of sources for this kind of thing now. Try the book ‘Relentless Forward Progress’. It’s aimed at up to 100 mile Trail races but you can get some useful info to take with you for multi-dayers. There are a few write-ups out there too from some of the UK pioneers who went out to get fast times for likes of C2C and Pennine Way, like Mike Cudahy (‘Wild Trails to Far Horizons’).